Sparrow saw the squirrel first and reacted by pulling hard at the leash. Certain the squirrel would be up the tree long before Sparrow could reach it, I flipped the switch on the leash and off Sparrow went. I glanced aside for a moment and when I looked back I was shocked to see the squirrel was still on the ground. 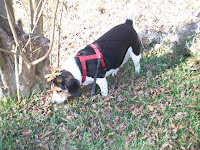 Even more shocking was the fact that Sparrow was standing beside the squirrel, sniffing him from one end to the other. I don't think the squirrel thought it was a proper greeting. As I came closer to investigate the duo, the squirrrel started to scamper up the tree, only something was wrong with it's back left leg. It couldn't move fast and was even having trouble holding onto the tree bark. He managed to get up about four feet -- just out of Sparrow's reach -- and then froze. Realizing that Sparrow was significantly increasing the squirrel's distress, I took her inside, which increased Sparrow's distress. She did not like having to watch this from the window! I went back out to the tree. By this time, the squirrel had managed to make it up an additional three feet or so to the fork in the tree. I felt helpless and sad for the little squirrel - not yet an adult, but more than a baby - it would certainly die soon there in the fork in the tree. I checked on the squirrel several times throughout the afternoon and I prayed for him often. At first I felt silly, praying for a little squirrel. "The Lord is busy holding the universe together, and I'm asking Him to heal a little squirrel!" But my heart ached so much for this little creature and I felt so powerless to affect any change in his life except through prayer. I would go out and look up at the fork in the tree and several times I thought he was dead. Then he would open his eyes or move his tail, just enough to give me some reassurance. The next morning, I was certain the squirrel would no longer be alive, after all, it had been a whole day now. He was still there, nestled in the fork of the tree and my heart melted with relief as two tiny eyes opened toward me from their high perch. I decided he needed some food, and I had some shelled pecans -- he was a southern squirrel, surely he liked pecans. I grabbed a handful and went out to test my aim. From the back of the tree, I couldn't toss the pecan so it landed in the fork of the tree and didn't tumble out again. I tried from the front of the tree and on the third toss, I heard a faint little sound - a tiny exclamation of sorts - as I followed the trajectory of the pecan. I am sure I hit my little friend on the head. That afternoon, puzzling with the issue of how to get water to the squirrel, I went to check on him. This time I didn't expect him to be dead, I expected to see those cute brown eyes. I didn't expect what I found, though. The pecan from earlier was there, but no squirrel. He was gone. He wasn't in the fork of the tree, he wasn't in the bushes under the tree. I couldn't see him in the branches of the tree. The brush under the tree didn't look as if any other dog had been by to try to disturb him. He was just gone. I don't know where the little squirrel went, but I know Someone who cared that I cared about the little squirrel, in fact, who cared about the little squirrel Himself. I don't know where the squirrel is, but He does.